Jason Kitts, owner of Rainbow International of Monroe, heard about Lotus Smith, a local school bus driver with breast cancer, on the recent “Bald Is Beautiful” series on Local 4 TV. Her struggle living amidst mold-infested water damage caused by a sewage backup hit home with Kitts and his team. “We were concerned about the amount of mold and its effect on her breathing during chemotherapy treatment. With her compromised immune system, we knew the combination was toxic so we stepped forward to make a difference for her,” said Kitts. After a quick assessment of her home, the restoration experts determined there was mold throughout the entire basement in the drywall and structure. They devised an extensive clean up and restoration plan and worked with several other professionals to remove all of the water-damaged drywall, dry out all of the structure, and power wash everything. The value of the four-day job to assist Smith added up to about $30,000, which they absorbed to make Smith’s home safe for her to live, breathe and recover from her cancer treatments. Smith has now finished her cancer treatment and will have surgery in January. She couldn’t stress enough how much she appreciates the team at Rainbow for making her home a safe place to live and breath as she battles cancer. “They even had a chemist come in and test the air for mold and asbestos to make sure the air was clean and safe for me. I can’t thank them enough for what they did for me,” said Smith. The experts at Rainbow International are professionally trained to provide mold remediation to prevent the spread of mold in commercial and residential properties. Their professionals isolate damaged areas, remove affected materials, and eliminate moisture sources to reestablish a healthy living environment for property owners. “Our restoration experts engage in extensive training in mold remediation and are skilled in the latest restoration and cleaning techniques and equipment. Jason and his crew in Monroe are one of our best mold teams in the Rainbow International system,” said Jack White, Vice President of Technical Services at Rainbow International. 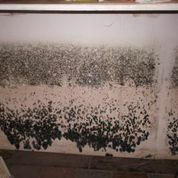 According to the Environmental Protection Agency and The Centers for Disease Control, living in a mold infested home poses a health risk to dwellers in the form of headaches; breathing difficulties; persistent cough; burning or irritation of the eyes, nose, throat, or lungs; asthma attacks; skin irritation; allergic reactions; and infections in immune-compromised individuals. In the event you face a mold threat or disaster, contact the experts at Rainbow International for a consultation and mold removal estimate. Customers can expect professional, quality service, as well as genuine concern and exceptional customer service. Keep Rainbow International’s number – 855-774-6815 - with your other emergency contacts, and call in the professionals to start restoring your home and life. They have locations across the U.S. and abroad to meet your needs 24 hours a day, 7 days a week to restore damages due fire,water, mold, and more.